We use ratios to make comparisons between two things. When we express ratios in words, we use the word "to"--we say "the ratio of something to something else." Ratios can be written in several different ways: as a fraction, using the word "to", or with a colon. Let's use this illustration of shapes to learn more about ratios. How can we write the ratio of squares to circles, or 3 to 6? The most common way to write a ratio is as a fraction, 3/6. We could also write it using the word "to," as "3 to 6." Finally, we could write this ratio using a colon between the two numbers, 3:6. Be sure you understand that these are all ways to write the same number. Which way you choose will depend on the problem or the situation. There are still other ways to make the same comparison, by using equal ratios. To find an equal ratio, you can either multiply or divide each term in the ratio by the same number (but not zero). For example, if we divide both terms in the ratio 3:6 by the number three, then we get the equal ratio, 1:2. Do you see that these ratios both represent the same comparison? Some other equal ratios are listed below. To find out if two ratios are equal, you can divide the first number by the second for each ratio. If the quotients are equal, then the ratios are equal. Is the ratio 3:12 equal to the ratio 36:72? Divide both, and you discover that the quotients are not equal. Therefore, these two ratios are not equal. Are 3:12 and 36:72 equal ratios? The quotients are not equal —> the ratios are not equal. You can also use decimals and percents to compare two quantities. In our example of squares to circles, we could say that the number of squares is "five-tenths" of the number of circles, or 50%. When two ratios are equal, then the cross products of the ratios are equal. A proportion is simply a statement that two ratios are equal. It can be written in two ways: as two equal fractions a/b = c/d; or using a colon, a:b = c:d. The following proportion is read as "twenty is to twenty-five as four is to five." In problems involving proportions, we can use cross products to test whether two ratios are equal and form a proportion. To find the cross products of a proportion, we multiply the outer terms, called the extremes, and the middle terms, called the means. Here, 20 and 5 are the extremes, and 25 and 4 are the means. Since the cross products are both equal to one hundred, we know that these ratios are equal and that this is a true proportion. 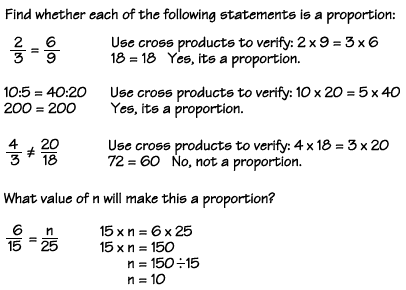 We can also use cross products to find a missing term in a proportion. Here's an example. In a horror movie featuring a giant beetle, the beetle appeared to be 50 feet long. However, a model was used for the beetle that was really only 20 inches long. A 30-inch tall model building was also used in the movie. How tall did the building seem in the movie? First, write the proportion, using a letter to stand for the missing term. We find the cross products by multiplying 20 times x, and 50 times 30. Then divide to find x. Study this step closely, because this is a technique we will use often in algebra. We are trying to get our unknown number, x, on the left side of the equation, all by itself. Since x is multiplied by 20, we can use the "inverse" of multiplying, which is dividing, to get rid of the 20. We can divide both sides of the equation by the same number, without changing the meaning of the equation. When we divide both sides by 20, we find that the building will appear to be 75 feet tall.